Megan McDonald developed an outreach plan to accompany a water saving toolkit. AT&T enlisted Megan McDonald to draft a 12-month outreach program to increase awareness and adoption of the water efficiency toolkit that was jointly developed by EDF and AT&T. Megan recommended that AT&T maximize public exposure using social media to distribute national and regional news stories, press releases and blogs to a broader audience. Additionally, she identified the established, individual networks of AT&T’s external affairs team as valuable resources for direct outreach. She crafted supplemental resources to support its direct outreach, including regional fact sheets, Q&A references, Twitter quick references, potential contacts lists, national and regional water and sustainability events lists and a message framing guide. She also selected a webinar to provide a technical reference for toolkit users. Finally, McDonald worked to refine the website to improve the user experience and increase the likelihood that a user downloads the tools and attends the associate webinar. This outreach program is expected to distribute the water toolkit in five water-stressed regions by the end of 2013, and 12 regions across the United States in the next year. Widespread adoption of water conservation programs by commercial, industrial and institutional buildings in these regions could save 28 billion gallons of water annually. 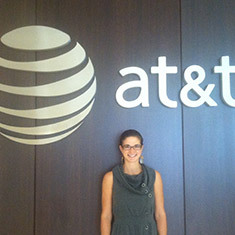 Megan McDonald, a student at Presidio Graduate School, was hired as a 2013 EDF Climate Corps fellow at AT&T.